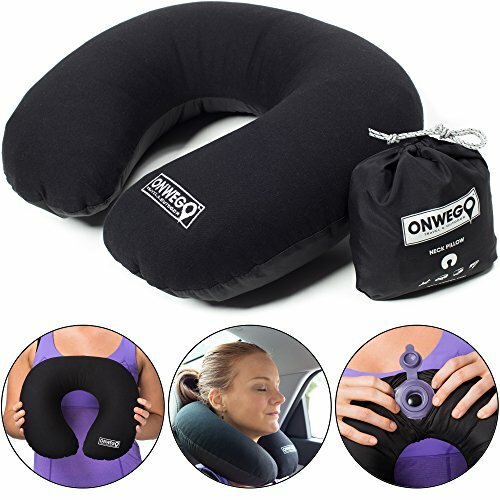 Best Inflatable Travel Pillows: No More Stiff Necks! 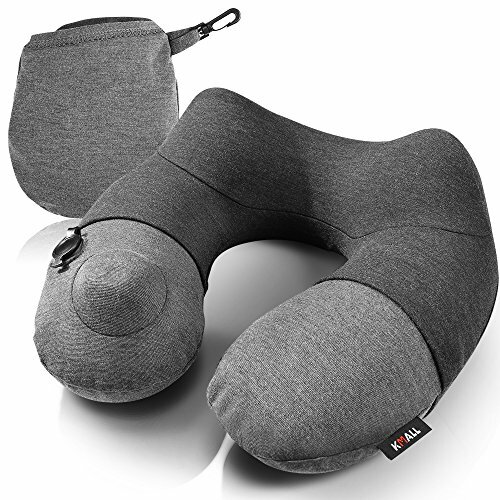 Home » PIllows » Best Inflatable Travel Pillows: No More Stiff Necks! If you have the best inflatable travel pillow, you will surely be well rested by the time you arrive at your destination. This might be just a small thing to some, but for frequent travelers, this can really be a great deal of help. It is time to say goodbye to stiff necks and the difficulty of sleeping while in transit. Definitely, inflatable travel pillows are not made equal. Some will offer proper support while others are just plain pillows that you can put around your neck. Also, since we are talking about inflatable neck pillows, it is important to know how you will inflate it. You would not want to carry around a pillow that will make you lightheaded just because you have to use it, right? With that said, let us flesh out the best of the best in this article. Let us take a look at our top three picks and see which one will be your travel buddy. Let us start our review with an inflatable travel pillow that looks like that of a velvet couch. There is really no correlation with a couch other than the fact that it looks luxurious which is a plus for those who are big on aesthetics. But this one can also be easily inflated in just 30 to 60 seconds. More than that, no more manual blowing for you because you can inflate it with the use of its built-in inflation pump. As for its support, it does not work like that of microbeads or memory foam. Instead, you can adjust the inflation level of firmness and size based on your preference and need. The pillowcase is also made of micro-velvet, and it is removable. Additionally, it comes with a travel packsack, so it is easier for you to carry it anywhere. Lastly, it comes in five colors which are blue, pink, grey, purple, and dark blue. Its lining is made of satin, and it already has a carabiner clip. The next inflatable travel pillow that we are going to talk about focuses on comfort. In fact, its design was built around the idea of being comfortable in as far as having the design being able to accommodate all head sizes. More than that, it can also offer support and give you a luxurious feel. Just like the previous one, you can also just push a button so that it will be inflated. This is great so that bacteria will not be spread by blowing through your mouth. Its U shape design and the humps that came along with it also help with proper alignment of your spine, neck, and head. As for its cover, it has something that is called a cool cover which allows the humidity to escape so that you will not feel too hot while wearing it. It is also made of a soft material which you can remove for washing. At the same time, its size is compact that you do not have to carry a packing case with you. The last inflatable neck pillow that we are going to discuss is actually the simplest of them all. Of course, that does not mean that it is the worst one. It also offers support and comfort with its comfortable material that is polyester. This material will also ensure that you will not get hot as it is breathable. Unlike the other products, this one needs you to inflate it manually with the use of your mouth. But do not fret because it has a unique air valve system that will allow you to inflate it fully with just two breaths. You can also adjust the firmness by deflating it or pressing the inner flap. It also does not weigh a lot so you can carry it with you anywhere. At the same time, it comes with a packsack that has a drawstring, so you can easily store it away. Further, its cover can be removed for washing, and the inner seam is very soft so you will not experience any skin irritations. The valve can be hard to seal. You might have noticed a trend in reading each review, and that is the fact that they excel in different categories. One can be so comfortable while the other is great for support, and there is also one that is great for portability. 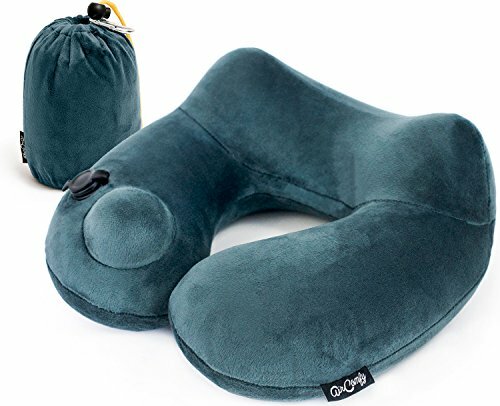 But of course, if we have to choose only the best inflatable travel pillow, we recommend the AirComfy Daydreamer Inflatable Neck Travel Pillow. We chose it because it is the inflatable neck pillow which somehow has balanced advantages and disadvantages. Yes, it is not perfect, but its cons have specific easy solutions unlike the other ones in the list. More than that, it provides comfortable wear and it is a breeze to inflate. At times, you might feel a bit stuffy, but that is based on the way that you wear it around your neck. Also, you really do not have to worry about having a stiff neck because it can properly support your head and neck to your spine. Further, its very luxurious cover will help lull you to sleep as it is very soft.